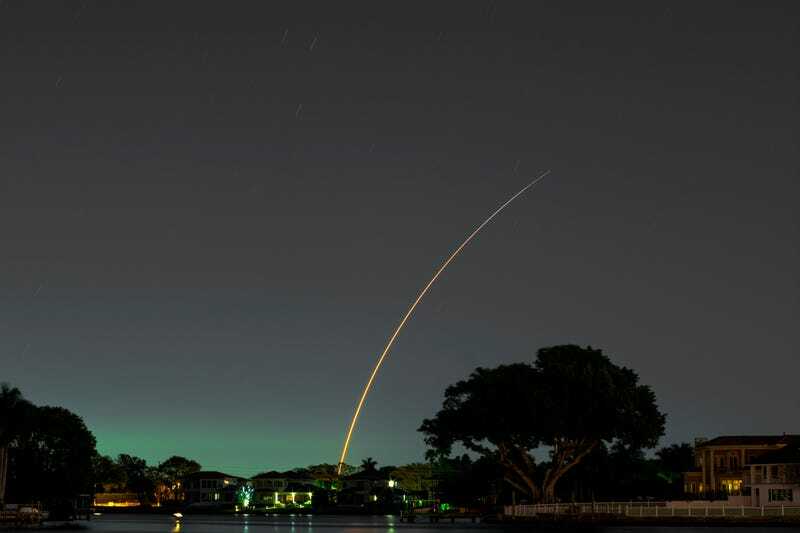 SpaceX launched the EchoStar XXIII communications satellite early this morning, 2:ooam EST. It was in the middle of the night and actually cold out, but I dragged the gear to my spot to watch it go up. The visibility last night was stellar (Get it? Stellar?)! The rocket was visible to the naked eye for about six minutes. I lost sight of it once it went far enough to the east to start to look low in the sky and got lost in the light pollution. But it wasn’t low in the sky, it was in space, travelling with the curvature of the earth. I took four long exposure shots as it flew up and away, which required moving the camera slightly. The last two didn’t work out very well as the camera still had some residual vibration from the quick move. I was able to take the rocket burn trail out of the second shot and stitch is in to the first. It worked out pretty well. I probably could have gotten this all in one exposure, but a brainfart move on my part meant I was just barely set up in time. I was a little unsure of the boundaries of my frame. Next time... which is tomorrow night! There is a Delta IV going up Friday night just before midnight and it’s looking like another cloudless sky!